A few weeks ago, a friend of mine hosted an online Usborne books party. Basically, a rep from Usborne books posted info and suggestions to the group of friends who “attended” the party, and we could ask questions and get recommendations based on the ages and interests of our little ones. 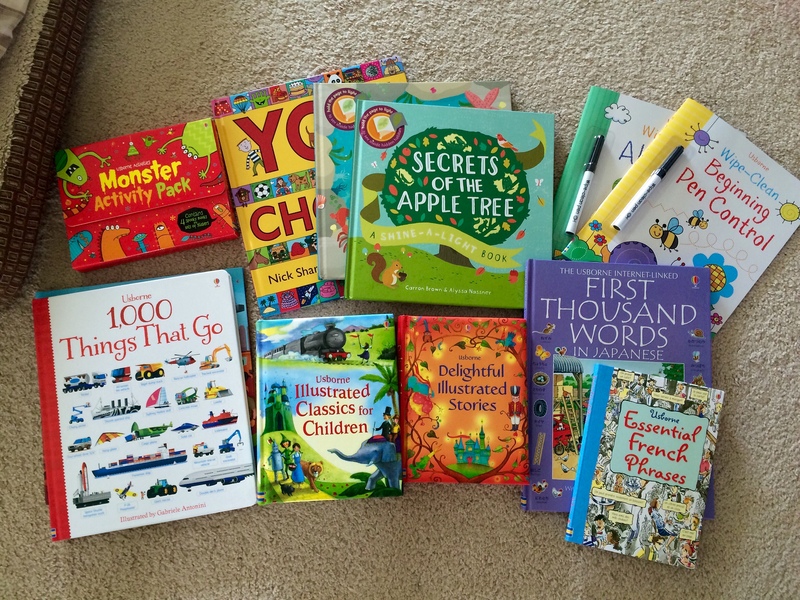 I’m in no way affiliated with Usborne books – I’m not a rep, and I don’t know any reps aside from the one I ordered from at the online book party. I actually came across Usborne books at a craft fair once, bought a book, and really liked the quality. Since then, I’ve been on the lookout for an Usborne books rep, and I was pleasantly surprised to receive a Facebook invitation to that Usborne book party. I admit I went a little crazy. I ordered a slew of books, some of which I intend to give as gifts. I ordered books for various age levels, and will be doing a more thorough review on them later. Side note: If you live in Hawaii like I do, and choose the “Media Mail” option for shipping… know that your books will probably take three or so weeks to get to you.